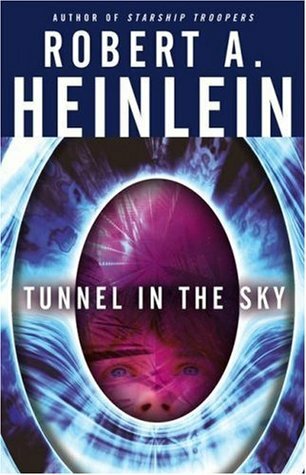 Heinlein’s juvenile novels can be a mixed bag which can vary from cloyingly optimistic “gee wiz” awe of space travel to social commentary using young people to reboot civilization and take the best (or be mired in the worst out of habit). Tunnel in the Sky is somewhere in between. What starts out as an adventure story of a teenage boy, Rod Walker, accidentally trapped on a distant planet trying to survive quickly becomes a blueprint for forming a colony, including politics, laws, and job assignments, when Rod finds dozens of other schoolmates who are in the same survival program. A large percentage of the book is set aside to debate the appropriate foundation of government in a lone town and how to ensure its long term survival; a conversation that can be as fascinating as it is frustrating. Rod Walter feels somewhat autobiographical, a smart and determined slightly abrasive loner who strives toward independence and pragmatism. A criticism of the time in which this was written, and Heinlein specifically, is his depiction of gender. While he crafts several strong female characters, Rod’s squadron leader sister Helen, the hunter Carolyn, and survival-savvy Jackie to name a few, whom Rod sticks up for both throughout, the women appear to be just as content with becoming stay-at-home mothers as being adventurers. This is even in contrast to the male characters who, for the most part, are interchangeable and forgettable. Additionally, common of the genre there is more focus on the possibilities than actual science. For instance, just how does one use uranium to maintain teleportation gates that connect distant habitable planets? Yet, Heinlein’s documenting the requirements of survival without modern day manufacturing, literally returning to a time before the Bronze Age with the knowledge of human endeavors, can offset these detractors. Notably, especially coming from a writer, was the frustration around the lack of paper in which to document the settlement and lay down their laws. One final note, I appreciated the advice of Rod’s sister, Helen, who explained why he should not take a gun on his survival trip. She claims it would make him cocky and overconfident. She recommended taking a good knife, or use his bare hands, which would force him to be more attuned to the dangers around him and learn to avoid them, not confront them. Kudos to this sentiment. Sign into Goodreads to see if any of your friends have read Tunnel in the Sky.